The automation interface is now available in 64-bit, as well as 32-bit, providing improved performance in 64-bit automation clients. HttpWatch also includes a 64-bit version of the HttpWatch Studio log file viewer that can load larger files and filter data more quickly. The 64-bit version of Windows Vista is becoming increasing popular due to its ability to access more than 4 GB of physical memory. To an ordinary Windows user, there are few noticeable differences from the 32-bit version because it can run both 32-bit and 64-bit programs. 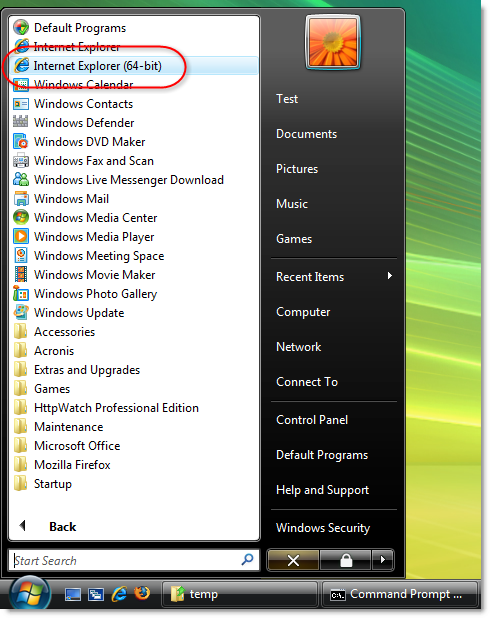 In this post we wanted to answer some of the questions you may have about Windows Vista 64-bit and the effect it has on the use of Firefox, HttpWatch and Internet Explorer (IE). How can I tell if a program is running in 32-bit or 64-bit mode? 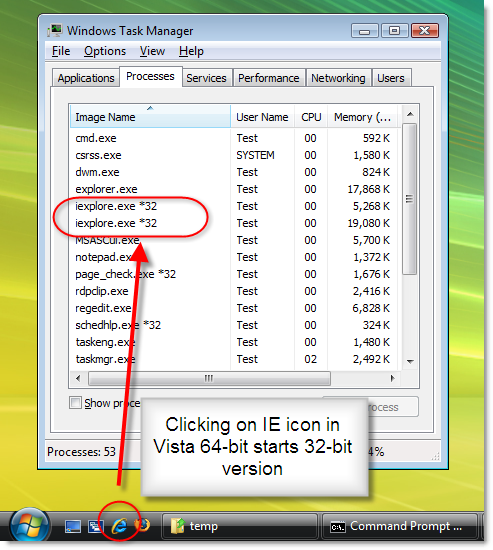 Why does IE run in 32-bit mode by default on Vista 64-bit? Microsoft has done this because the 64-bit version of IE can only load 64-bit browser extensions and most extensions, such as the Adobe Flash player, are only available in 32-bit. Without the Flash player, you can’t use sites like YouTube or BBC iPlayer. That’s a non-starter for many web users and the reason why 32-bit IE is the default on Vista 64-bit. Right now our plan is to run SL in 32-bit mode (and not have a 64-bit native version). This is mostly because other browser plug-ins (and most browsers) don’t support 64-bit yet. We are looking at adding native 64-bit support in the future though. Can I run Firefox in 64-bit mode on Vista 64? There are no releases or nightly builds of 64 bit Firefox for Windows from Mozilla as the earliest release to likely have 64-bit versions is Firefox 4.0. The only option you have is either roll your own or use a third-party build. There’s little motivation for the browser vendors to go 64-bit because unlike other applications, such as memory hungry video editors or database servers, web browsers will not see significant performance benefits in 64-bit mode and there is also the problem with the lack of 64-bit extensions. Can I use HttpWatch on Vista 64-bit? Yes, you can use HttpWatch on Vista 64-bit but it is currently only available in 32-bit. 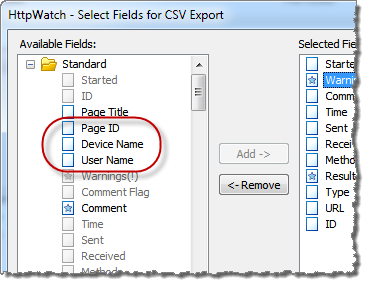 This means that the HttpWatch plug-in can only be used in the 32-bit edition of IE. We will provide 64-bit plug-ins when Adobe, Microsoft and Mozilla provide significant 64-bit support. 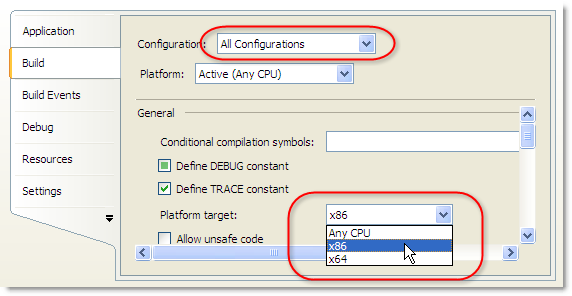 The automation interface can be used from 64-bit programs without making any changes so as long as you have HttpWatch version 6.1.32 or later. In some cases, such as accessing a .hwl file opened with the OpenLog method, you may see reduced performance in a 64-bit program. 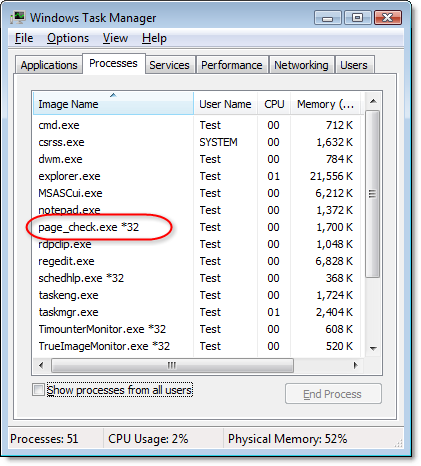 This is because the 64-bit API support in HttpWatch uses a separate WIN32 process rather than directly loading the API. To avoid this issue make sure that your client program runs 32-bit (see below). 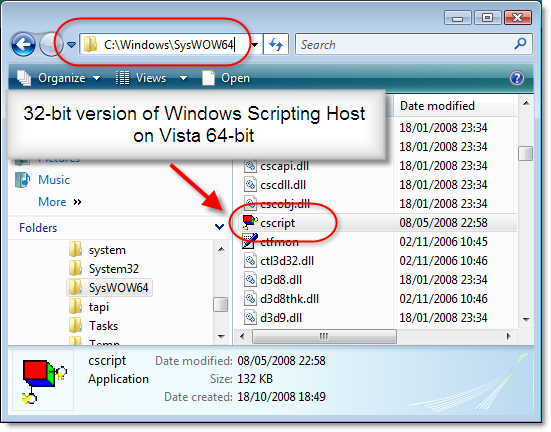 Can I use the HttpWatch version 5.x automation on Vista 64-bit? If you’re seeing this error with HttpWatch version 6 make sure that you’ve installed version 6.1.32 or later. How can I get my HttpWatch automation program to run 32-bit? You want to improve data access performance on log files that are opened using the OpenLog method.